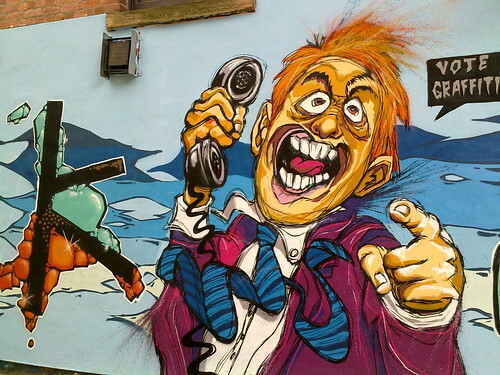 Why do Nottingham City Council hate urban art? As I’ve said before I feel privileged to live in Nottingham, a wonderful, bright, vibrant and dynamic city. Nottingham is home to many creatives due to its great universities, central location and general pleasant atmosphere. Its a cool city and a lovely place to live. The creative arts are well catered for, multiple excellent music venues, galleries and co-working spaces provide areas for expression. Nottingham is home to some great urban art. Graffiti artists produce some great quality stuff in this city, so why are the council trying to eradicate this form of expression? Just over a year ago the leader of Nottingham City Council, John Collins announced the banning of legal graffiti sites. He referenced a 1982 article by social scientists James Q. Wilson and George L. Kelling. The ‘Broken Windows Theory’ of norm setting and signalling that leads to social disorder and vandalism is often used by the establishment and has been subject to a large body of criticism. It has been criticised as being unsound and a largely unprovable. When tested, in general, the test has been inconclusive. However the council have used this theory to ban legal sites and spend thousands painting over urban art on waste land in an attempt to sanitise the city. Money that potentially could have been spent in better ways, more youth engagement projects for example. Graffiti is competitive by its nature and while I agree its not all good quality the bar would be raised over time if it was left. You need to make poor art to learn how to make great art. All forms of creativity are valid and precious, I just wish John Collins and Nottingham City Council understood that.